Welcome to Grab & Go. 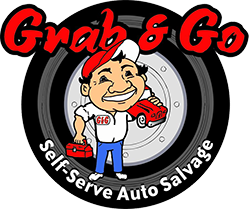 Grab & Go is a self-service auto salvage yard where you save B$G money by using your own tools to pull parts from our HUGE inventory of Vehicles. Hours: See hours for each location on our homepage and contact page. No admission 30 minutes prior to close. Admission: $2.00 cash, daily admission per person. Payment: We accept cash and Visa/MasterCard/Discover for purchases. No checks. Returns: Miscellaneous items (including but not limited to tire irons, clothing, jacks and ice -scrapers), anti-freeze, tires, windshield fluid, broken or cracked glass, seats, whole vehicles, and individual parts on a whole vehicle, may not be returned or exchanged. Unless otherwise noted, all parts are sold with a one-time 30-day return policy. You may return the part for store credit or exchange within 30 days of purchase (no store credits or exchanges after 30 days of original purchase). Store credit must be used within 90 days from date of return and the credit memo must be presented (otherwise store credit will be null and void). All items returned must (1) bear a Grab & Go mark, (2) be accompanied by the original printed sales receipt and (3) not be dismantled in any way. Labor: Customer is responsible for providing all labor and any labor costs. No Warranty: All Parts, whole vehicles, goods, and services are sold on an "AS IS" basis and with all faults. GRAB & GO DISCLAIMS ANY AND ALL WARRANTIES, EXPRESS OR IMPLIED, REGARDING ANY PARTS, WHOLE VEHICLES, GOODS AND SERVICES IT SELLS INCLUDING BUT NOT LIMITED TO ANY WARRANTY OF MERCHANTABILITY, ANY WARRANTY OF FITNESS FOR A PARTICULAR PURPOSE AND ANY WARRANTY OF NON-INFRINGEMENT. All sales are subject to Grab & Go's Terms and Conditions. Core Charges: Core charges apply to some parts (see price list). You can avoid a core charge by bringing an appropriate exchange part at time of purchase. You can also get a core charge refund if you bring in an appropriate exchange part within 30 days of purchase along with the original printed sales receipt. The exchange part must be the same type of part that was purchased and to which a core charge applied. For example, if you purchase a motor, there will be a core charge; you can receive a core charge refund if you bring your old motor to Grab & Go within 30 days of purchase along with the original printed sales receipt. All cores must be returned drained of all fluids. Catalytic Converters: At no time will Grab & Go sell a catalytic converter. Must be 18 years or older to enter the yard. 16 and older will be allowed to enter with a signed parental consent form available at the Grab & Go Salvage, LLC office. Closed toed shoes or boots recommended. No flip flops. No firearms, alcohol or drugs. Grab & Go reserves the right to deny admittance to anyone for any or no reason whatsoever. To enter our yard, you will be required to pay the Entrance Fee, sign the Customer Release and Indemnity Agreement and follow all Customer Rules and other rules. No torches or jacks allowed. Bring your own hand or battery operated tools. No tools are supplied. Customer tool boxes are inspected upon entering and exiting the yard. You will be charged for any part found in your possession when leaving the yard. Corrosive resistant clothing, safety goggles, and leather gloves are recommended. No removing, altering, or tampering with the car stands. Customers are responsible for providing a stock number for each part purchased. No cameras on the premises. Grab & Go is not responsible for lost or stolen items.